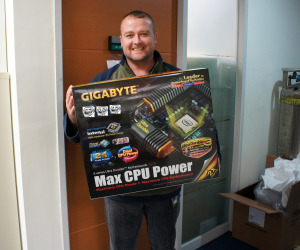 No, that is not a “little person” holding a motherboard (he’s not related to Ricky Gervais either), but rather the Deputy Director of motherboard marketing here at GIGABYTE, Tim Handley. Please visit Bit-tech HERE to find out more about this mysterious board. Hey tim wat are u holding sooooooooooooo large???? :O ..Its really OMG! Congratulations, Tim!! You deserve it! Merry Christmas, to you, and to Mr.Brix.